Have you ever had someone suggest that you step into your courage zone? If so, what did they really mean? Our daily activities often fall into two distinct categories. 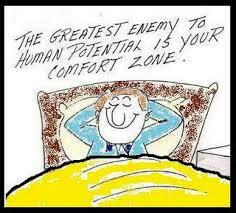 Our comfort zone consists of all the things that we are accustomed to doing. They are free from risk and often relatively easy. Our courage zone consists of things we’ve never tried before and even the thought of doing them produces feelings of fear and anxiety. For many, public speaking is a courage zone activity. While it’s normal to spend a large portion of each day in our comfort zone, those who consistently seek opportunities to step into their courage zone will more than likely report a greater vitality and zest for life. Why? Because true growth (personal and professional) happens in the courage zone. Several years ago I found myself going through the motions as a classroom teacher. I was smack dab in the center of my comfort zone and the word challenge was not even a part of my vocabulary. I would wake up in the morning, go to school, come home to grade a huge stack of papers, watch a bit of television, then start the same routine all over again the next day. I was numb to the potential of change. Then it suddenly hit me. If I wanted to go places in my career, I needed to do things that I hadn’t been doing. It wasn’t just going to magically happen while I sat on the couch with my 44oz. diet soda. Little did I know that my choice to sign up for an acting class, an obvious courage zone activity for me, would signify the beginning of the journey that has led me to where I am today. I showed up for my first class, sweating profusely and repeating the following question in my mind, “What the heck am I doing here?” Most of the people in the room were seasoned actors, many of whom had already been in commercials or starred in local plays. My only acting experience was during my teenage years when I would tape myself doing goofy skits using my parents’ enormous video camera; the kind that made your shoulder ache each time you held it. Needless to say, comfort was the last thing I felt in this new environment. Normally in situations like this, I would just quit and return to the safety of my comfort zone. After all, I didn’t like challenges and this was clearly a challenge. This time; however, I decided to stick it out. On the morning of our 5th class, I woke up in terror, realizing that it was my day to recite the monologue that I had been practicing for days. My inner critic told me to call in sick, which would give me another week to build up enough courage to act in front of a room full of professionals. Refusing to listen to the critic, I jumped in my car and made the 45 minute drive to the studio. Shortly after arriving, one of my fellow thespians approached me and asked, “Do you have a girlfriend?” Of course the answer was no; girlfriends didn’t fit in my comfort zone. “I have someone I want you to talk to,” he said. He then proceeded to dial a number and briefly spoke to the person on the other end of the call. He handed me the phone and said, “Mike, I’d like you to talk someone.” As I stuttered through the conversation, I realized that I was as far into my courage zone as I had ever been. Not only was I about to deliver my monologue, I was also talking on the phone with a complete stranger. Well, I’m happy to say that the monologue went very well. More importantly; however, were the follow up conversations with my new mystery friend, which ultimately led to our first date. As I drove to her house, I was once again sweating profusely, this time for a different reason. Hello courage zone! Having just overcome my fear of doing a monologue, I knew that I could handle watching the door open and laying eyes on my blind date for the very first time. As she opened the door and we met in person for the first time, I knew there something very special about this experience. I’m happy to say that the individual who opened the door that day is my beautiful wife of almost 8 years, Ruth. You see, I would have never met her had it not been for the courage I demonstrated by continuing to take the acting classes, despite my immense fears. Furthermore, it was Ruth who was instrumental in my choice to start KaleidoEye. After all, she was an entrepreneur who was used to stepping into her courage zone. Some would call this luck, while others might refer to it as coincidence. I like to believe that it was a result of my choice to be courageous in the face of fear, and to do something I had never done before. From that seemingly small choice to sign up for an acting class many years ago, I will forever reap the benefits. I’d love to hear your courage zone story. Please share something you have done in the past that required you step into your courage zone. Be sure to include the result. At the age of 36 (about) I decided to do an open water swimming event held near my home town. It is a mile long swim. Although relatively active I hadn’t done any swimming of lengths since school, I was a mediocre swimmer even then. In fact I was becoming increasingly averse to cold water. Never the less I joined a mate for training and eventually stood at the side of the dam feeling self concious in my costume amongst the hundreds of participants. Seeing how far a mile is in a straight line had me feeling nauseous with fear. I very nearly bolted. It was tough, particularly as there were so many other swimmers. Little children were like tadpoles as they squirmed over me. The water was of course quite choppy. But I don’t think I will ever forget the feeling of euphoria as my feet hit the concrete slipway on the other side. My legs were wobbly but I could tangibly feel something breaking in my head with a realisation that I could do anything I set my mind to. I lose track of the time sequence but not long after that I did a 50km walk, then had the opportunity to walk up Kilimanjaro. Each event had it’s own comfort zone which enabled me to do more. I took up canoeing, a sport in which I spend a lot of time out of my comfort zone. Trekked up to Everest Base Camp 5 years ago and then the biggest comfort zone stretch of all, started my own Life Coaching practice and left full time employment (the other way round actually). There have been some set backs. Canoeing wise I was trapped in a boat a few years ago which shook me badly and for a couple of years I wondered if I would ever get back to enjoying it. I spent some time just having fun on the water, becoming familiar with the river again with mates, and teaching some newies. That built my confidence again. I have been physically unwell for the last couple of years (some stress related and some injuries) that had me rattled but I am recovering and my confidence/energy is returning. If I hadn’t had that swim I sometimes wonder if all the other would have. Hi Fiona. Thank you so much for taking the time to share your courage zone story. I am inspired. Congrats on your Life Coaching practice. At the age of 25, in the month of May, I came out to Arizona to visit my dad. I had just graduated with an AA degree in ECE and upon my return home would start my career as Director of a brand new daycare. I was excited and thrilled and glad to finally get away before the ‘serious’ life stuff started. Everything had just landed in my lap. Unbeknown to me that is not quite how it all went down. I came out to meet my father and during my vacation here was introduced to Todd who was a friend of a friend of a friend… He was doing these friends a favor and was kind enough to show my sister and I around town. I was not eager about this and my attitude was quite negative as I told him the first time he called to arrange this outing that I had no interest in him and was already dating someone. Not quite the way to start a relationship with someone who is extending such an act of kindness. He showed us around Tempe, and took me out on other occasions. I was supposed to go home after 2 weeks, but instead cancelled my flight back and delayed it by 1 month. A month later as I made my way to the airport to head home I flet torn and found that I had a soft spot for Todd and that I never wanted to have that what if moment in my future. I called him from the airport and told him that I would go home, pack my bags and return to Arizona in 1 month. His response was, “do not move here for me”. It echoed in my ears and heart. I still held true to my decision. You have to understand that I suffer from severe anxiety, am the most inflexible person, have NEVER been out of my comfort zone, was born and raised in Montreal, Canada, come from a French culture and huge Italian family where no one ever moves away, had never been away from my mother who was my pillar and brought me comfort during times of anxiety, was a homebody and still lived at home. One month later as my mother drove me to the airport she begged me to think with my head and not my heart. I was torn. This was the BIGGEST and HARDEST decision of my life. I moved here in June when as you know the weather is absolutely sweltering, it was brown all around me, I missed the green! The culture was a shock and I couldn’t even work because I had no papers. I missed my mom terribly and didn’t want to be here but for one reason, Todd. This was the hardest thing I have ever done, and I was out of my comfort zone for at least 1 entire year, had severe panic attacks and still stuck through my decision and stayed. 17 years later I have been married to Todd for 15 years and have two incredibly beautiful daughters who still to this day teach me the American ways. I don’t ever regret the decision and cannot imagine my life had I not stepped out into the courage zone! Wow Cyndia! What a beautiful story. There is a lot to be said for those “gut” decisions that we all have.